Have you heard – this is a huge untapped market, we are the market leaders and we have no competition? Such a market does not exist and the above statement is nothing but a myth. 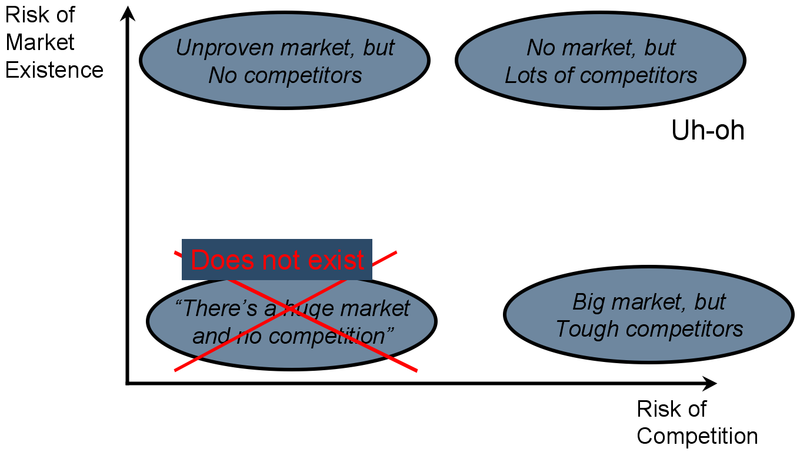 If you have no competition, you are probably in a market that does not exist. Think about it, wealth attracts a crowd and hence if indeed there is a huge market for your products or services, do you expect your competitors to sit ideal while you dominate the market? You may start a company with a great idea (a game changer) in a large market, but it is only a matter of time before you draw attention. In fact, once competition shows up to the party, they validate that there indeed is a large market and your gut was right when you started the company. So when you see healthy competition, embrace it, because if it is a large market, the pie is usually large enough for multiple players to happily co-exist. Big market tends to attract many competitors and initially ends up to be a very fragmented market which eventually consolidates into a few key players. Your objective should be the market leader when a few key players are left standing. But stop fooling yourself, your employees or your customers that you are a market leader in a large untapped market that has no competition. ‹ PreviousWhy do salesmen lie?